Searching for Bonobo in Congo » About Elephants and Pigeons in Congo’s Forests. 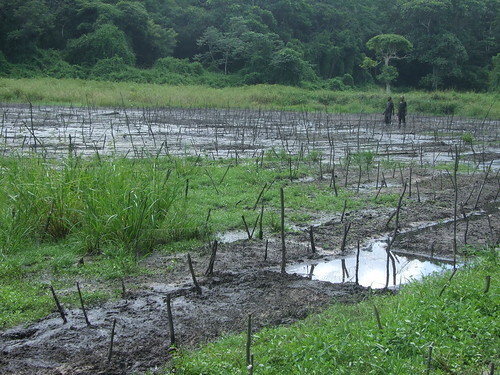 « Hunters Pull Back from Lomami’s Bonobo Forests. About Elephants and Pigeons in Congo’s Forests. 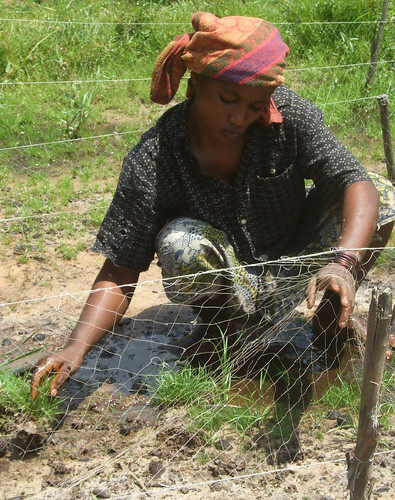 There is a small forest opening in the mile after mile of closed forest that stretches east from the Lomami River and into the watershed of its tributary, the Loidjo. Fifteen years ago and “forever” before that, people came not to hunt, but to make salt. They came with traditional clay pots and boiled the water until only salt was left. Hundreds, maybe thousands, of forest elephants came for the salt water as well. This mineral lick was part of an elephant culture. 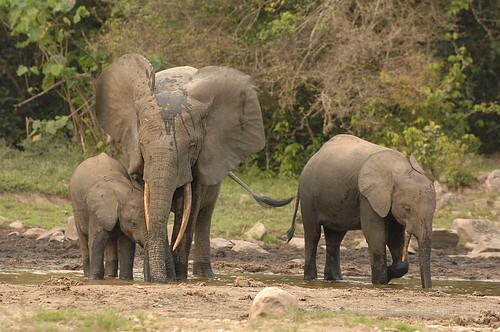 Elders in the villages of the Balanga say that the elephants came in group after group: mothers with their young, older siblings close to younger siblings. Buffalo came. Bongo came. Even when people switched mainly to salt imported from elsewhere, they still did not disturb the culture of the elephants. They hunted only small animals with snares. And then war swept out of the east into the town of Kindu and people fled into the forest, and foreign soldiers with military guns followed into the forest. Lots of guns followed into the forest. The last elephants were killed at this clearing in 1999. Then the last of the buffalo were shot. Then the bongo. But still the pigeons came for salt; Pigeons came by the thousands. 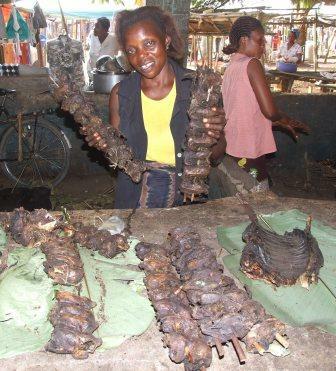 In 2000 they started capturing pigeons and smoking them for the market in Kindu –small, skewer-sized bushmeat. Ready to be be-headed, plucked and smoked. 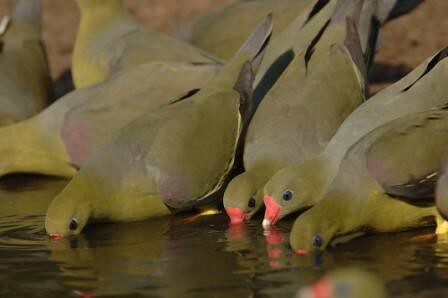 The Africa Green Pigeon, Treron calvus, so abundant that it might be hunted out. 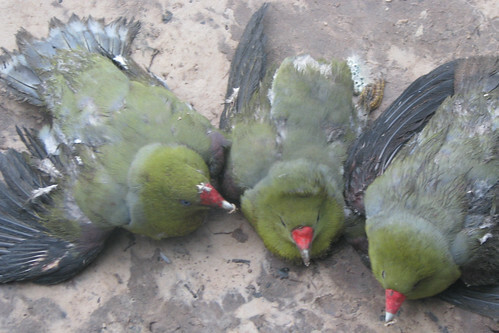 The trappers at the TL2 clearing say the pigeon catch is diminishing. Every day the nets are stretched across the opening, every bit of bare ground is covered. Eight years ago they would catch more than 1500 pigeons each day. Now they catch between 250 and 400 in a day. The nets are up every day. The nets strung through the opening now called “Parc des Pigeons”. Remember the North American passenger pigeon? There were once so many they would eclipse the sun as they flew by. Now, they are no more. The photos below were taken last month at “Parc des Pigeons”. 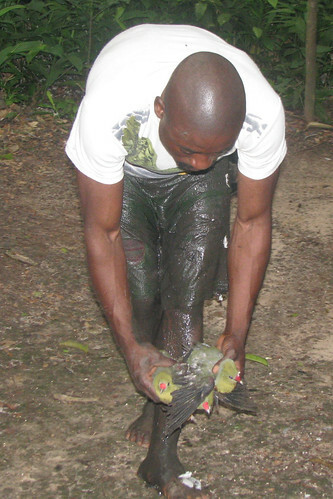 A trapper extracting pigeons from his nets. Pigeons are extracted once in the morning and once (here) in the evening. These will be sold directly to traders waiting in the adjacent camp. Net repair is among a trapper’s regular chores. The trapper’s job is a muddy one. It is one hunting job where there are plenty of women doing the dirty work. The smoked pigeons for sale in Kindu. To get here the traders walked 19 km from the Parc des Pigeons to the road and then continued by bicycle the rest of the way. How Many Elephants Are Left in D.R. Congo ? This entry was written by Terese Hart, posted on 2009-07-12 at 1:58 pm, filed under Bushmeat, Elephant, History of TL2. Bookmark the permalink. Follow any comments here with the RSS feed for this post. Post a comment or leave a trackback: Trackback URL. Horrible to see over-rapacious hunting like this. Down here in South Africa, Green Pigeon and Rameron (Olive) Pigeon also visit salt and mineral deposits. You guys should write a short note for Malimbus or perhaps African J. Ecology. There is still a paucity of papers/info on geophagy in African pigeons. And, of course, the conservation implications. A study of the distribution, history and use of these “edos” or “baies”, or whatever these mineral openings are called, would be fascinating, but not easy to do. When we did the okapi study in the Ituri in the early 1980s we came upon an opening that was growing over, and only had a collection of old elephant bones and de-tusked skulls. On the otherhand I would imagine some are very ancient. If a good enough number of these openings undisturbed by humans could be found, it would be interesting to compare visitation between sites: What animals come compared with what animals are in the surrounding forests. This really is a sad story. Is there any possibility for farming pidgeons – or would it be to ineffective? hello i am french. i stud biology end i breed treron in captivity. i have some species like ( calva, waalia, curvirostra, vernans). i would find information about pigeon’s way of life. i would taking contact with somewhere have already see green pigeon in africa. Vous pouvez écrire en français si vous voudriez. La manière de voir des Treron (au moins T.calva) est de visiter ces ouvertures dans les forêts. Il faudrait au moins quatre jours pour y arriver à partir de Kindu (capitale de la province de Maniema). If you breed with the species of calva, waalia, curvirostra, vernans. I like to buy some pairs .Is this possible. hi Terese tank for your answere can you give me your personnal adresse because i would make a travel to africa for stud. answer for piet voets you can go to the french forum “colombe exotique forum actif”. you write this word one your web board. How can they do like that .hard to see the images,if their one of their family members caught like birds,.how would the feel.